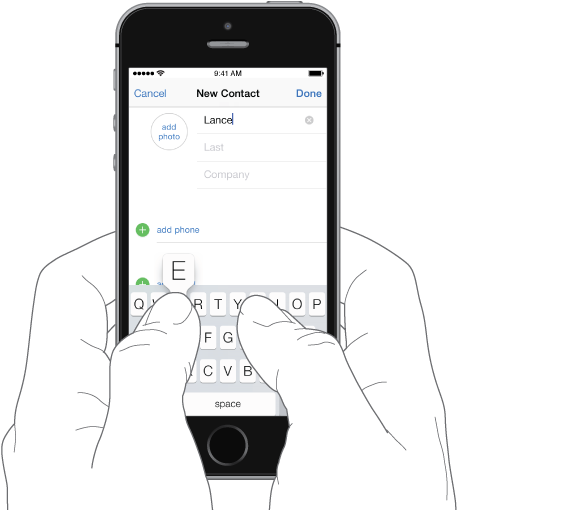 Tap a text field to see the onscreen keyboard, then tap letters to type. If you touch the wrong key, you can slide your finger to the correct key. The letter isn’t entered until you release your finger from the key. You can also use an Apple Wireless Keyboard to enter text. See Use an Apple Wireless Keyboard. To dictate instead of typing, see Dictate. Tap Shift to type uppercase, or touch the Shift key and slide to a letter. Double-tap Shift for caps lock. To enter numbers, punctuation, or symbols, tap the Number key or the Symbol key . To quickly end a sentence with a period and a space, just double-tap the space bar. Depending on the app and language you’re using, iPhone may correct misspellings and anticipate what you’re typing. Accept a suggestion by entering a space or punctuation, or by tapping return. To reject a suggestion, tap the “x.” If you reject the same suggestion a few times, iPhone stops suggesting it. If you see a word underlined in red, tap it to see suggested corrections. If the word you want doesn’t appear, type the correction. To set options for typing, go to Settings > General > Keyboard.